“Why try to explain miracle to your kid when you can just have them plant a garden”. 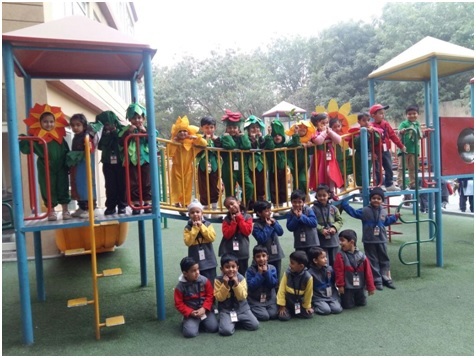 The students of Pre-School participated in the role play activity ‘Out in the Garden’. The children came dressed in beautiful costumes such as caterpillar, flowers, ladybug, butterfly, etc. It was a practical and fun filled learning endeavour as it exposed the students to various aspects of nature and its importance in our life. They went on a nature walk to get a practical feel of the role play and understood various concepts like germination of seeds, parts of a plant etc. The activity was a big hit as it helped the children to understand the beauty and importance of nature and preserving it for our future.